Flowers by Bauers, a flower farm in Harford County operated by Matt, Richard, and Charles Bauers, uses a computer system to grow better snapdragons. Olin, Alan and Chris Davis, members of a 5th-generation Kent County farm family, raise chicken, grain and even radishes to help reduce runoff into the bay. Annie's Project, a national organization dedicated to fostering female farmers, helps create success stories for Maryland farmers Janet Archer , Kim Lewis and Mary Stewart. 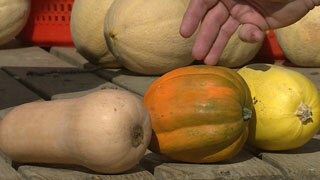 Local Buy: Al Spoler discusses different types of squash. 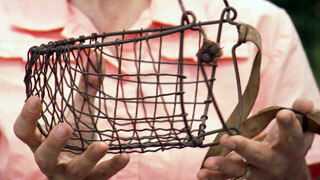 This is an antique plough horse muzzle. Farmers would put muzzles like this one on their plough horses during the harvest in order to prevent the horses from nibbling on the job. Bake in a large roasting pan, cut side up, at 400° F for hour, until squash is tender yet still holds its shape. Meanwhile make stuffing: Fry pork sausage until light brown. Remove pork to a colander to drain. Drain all but 2 tablespoons drippings from frying pan. Add onion, celery and mushroom; sauté 4 minutes. Stir in apple and sauté 2 more minutes. Cut the squash in half. Use a spoon to remove all of the seeds and then carefully cut each half into four wedges. Place the wedges in a large baking dish. Drizzle with olive oil and sprinkle with salt, pepper and brown sugar. Bake the squash for 60 to 75 minutes, or until soft and caramelized around edges. Remove the squash from oven. In a small saucepan over medium heat, add butter, walnuts and cranberries. Cook until the butter has melted, and then drizzle over the squash. Blend flour and salt in processor. Add butter. Blend in pulses until coarse meal forms. Add 4 tablespoons of ice water. Blend in pulses until dough comes together in moist clumps, adding more ice water by teaspoons if dough is dry. Gather dough into ball and flatten into disk. Wrap and chill for at least one hour and up to one day. Roll out dough on floured surface to 14 1/2 inch round. Transfer to 10-inch-diameter tart pan with removable bottom. Fold overhang in; press to form double-thick sides. Push sides up until 1/4 inch higher than top edge of pan. Pierce crust all over with fork. Freeze 10 minutes. Line dough with foil and dried beans or pie weights. Bake until sides are set, about 25 minutes. Remove foil and beans. Bake until crust is golden, piercing with fork if crust bubbles, about 15 minutes. Transfer crust to rack and allow to cool completely. Reduce oven temperature to 350°F. Melt butter in heavy medium skillet over medium heat. Add squash and thyme. Sauté until squash is just tender and translucent, about five minutes. Cool to room temperature. Whisk eggs, cream, salt, pepper, and hot sauce in a bowl. Arrange squash over bottom of crust. Sprinkle with mozzarella. Place tart pan on oven rack. Pour egg mixture into crust, filling completely (some egg mixture may be left over. Bake quiche until filling is golden and set in center, about 35 minutes. Transfer quiche to rack. Cool 15 minutes before serving. One of Maryland's longest-running squash festivals takes place at Butler's Orchard in Germantown - and has for the past 32 years. It focuses on perhaps the most iconic of all squashes: the pumpkin. October 2013 marks the 33rd iteration of Butler's Annual Pumpkin Festival, which features a pumpkin patch where visitors can pick their own pumpkins as well as hayrides, a straw maze, giant slides, and countless other fun Fall activities. Open Saturdays and Sundays through October. More information via their website, http://www.butlersorchard.com/ .